The Olympic Games is more than just about the competition. It’s also about good sportsmanship to fellow athletes from around the world, whether or not you’ve ever seen them before. Examples of the true Olympic spirit don’t really show themselves until a really dramatic moment appears during competition. 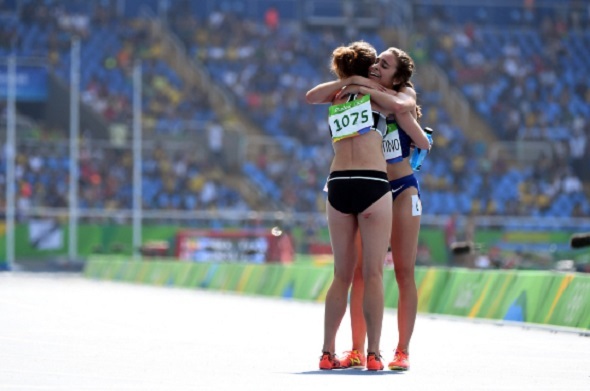 The latest example occurred this morning during the women’s 5,000m preliminary round, as shown by our Abbey D’Agostino. In the second of two heats, D’Ags was running in the middle of the pack for the first 3,000m of the race, feeling comfortable with the pace and how she was doing. She would need to have a top 5 finish in order to automatically advance to the Friday finals, or need a top 5 non-auto time. But tragedy occurred just before the 3,200m point. As athletes started to lap slower runners, D’Ags plowed into the back of New Zealand’s Nikki Hamblin, causing both athletes to fall to the track. Hamblin had originally slowed down as she was passing a lapped runner. D’Ags was the first to return to her feet, but rather than immediately resume running, she went to Hamblin and encouraged her to get back up. “When I went down, I was like, ‘What’s happening, why am I on the ground?’ And suddenly, there’s this hand on my shoulder like ‘Get up, get up, we have to finish this.’ And I’m like ‘Okay, yep, yep, yep, you’re right, it’s the Olympic Games, we have to finish this.’” Hamblin shared with Letsrun.com Jon Gault after the race. But when D’Ags tried to resume running, she fell to the ground in pain as the initial fall caused an injury to her right knee. It was time for Hamblin to return the favor as she encouraged her competitor to get up and finish. D’Ags ultimately got back up, slowly hobbling the remaining 1,800m of the race as other competitors lapped her. She finished last in her heat with a time of 17:10.02, but she finished. Hamblin finished ahead of her in 16:43.61. After crossing the line, she embraced Hamblin as she gave her signature tired grin. She left the track in a wheelchair and went to get a MRI in the Athlete’s Village to determine the extent of the injury. “I’m so grateful for Abbey for doing that for me. I mean, that girl is the Olympic spirit right there. I finished and I had a lonely last four laps but she ran four and a half laps barely being able to run. I’m so impressed and inspired that she did that. I’ve never met her before. Like, I’ve never met this girl before. And isn’t that just so amazing? That’s an amazing moment. Regardless of the race and the result on the board, that’s a moment that you’re never, ever going to forget. The rest of your life, it’s going to be that girl shaking my shoulder like ‘Come on, get up.’ And I really hope she’s okay. And I know that she’s young and she’s going to have so many more opportunities. And being such a good human being, she’s going to go so far.” Hamblin shared with Gault. D’Ags’ coach, Mark Coogan, said that she was in good spirits as she was carted off the track. If she is healthy enough to run again, she will compete in the 5,000m final with Hamblin as both of them advanced on protest. Fortunately for Bruno Hortelano, he was also able to advance to the next round of the 200m. He did so by winning his preliminary heat in a new personal best and Spanish national record time of 20.12, surprising the likes of Jamaica’s Yohan Blake (20.13), USA’s Ameer Webb (20.31), and NBC track announcers in the process. Hortelano – out in lane 8 – was in the 2nd/3rd position off the curve but had the strongest final 50m in the field to come up and nip Blake at the line. When he was interviewed by NBC afyer the race, Webb said he couldn’t see Hortelano out in lane 8 and how that likely misinformed Webb of his result as only the top 2 finishers were given an auto berth to the semifinals. An additional perk – Hortelano’s time was the second fastest of all of the qualifiers, behind only Canada’s Andre de Grasse with his 20.09. The semifinals will be held tomorrow evening at 9pm ET. This entry was posted on Tuesday, August 16th, 2016 at 1:19 pm. It is filed under Olympics, Spotlight. You can follow any responses to this entry through the RSS 2.0 feed.